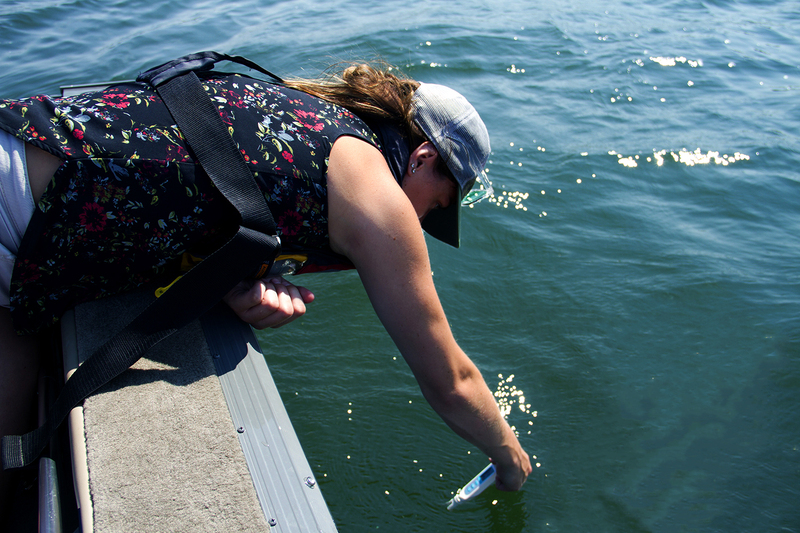 Secchi readings are an effective way to monitor water clarity in lakes and oceans. Secchi readings are an effective way to monitor water clarity in lakes and oceans, but not so helpful for shallow areas or streams. Suspended sediments in the water column affect how far you can lower the disk down and still see it. Some very healthy lakes will have very low readings if they are naturally muddy. Recording in the same place over time will give you a more accurate picture of what is normal for yours. The secchi disc has been used for over 2oo years, and remains one of the most important tests you can do to learn about water health. Scientists we’ve spoken to told us it’s so useful for understanding trends and changes. Lower the disk slowly into the water, letting it drop straight down. Once you can’t see it any longer, raise it back up a little bit until you can see it again, and then lower it back to the point where you can’t view it any more. Grab rope at the water to mark your spot. Pull the rope up and then determine the depth. The rope is marked on half meter intervals, in black or with a knot, and full meter in red. Once you have recorded your reading, fold up your rope. Leave disc out so the rope can dry. We only record water depth in this kit for when you can see the bottom in your test location. Use your secchi disc to record this. Lower your secchi disk until it touches the bottom, making sure the rope is straight up and down and there’s no slack in the rope. Calculate the water depth using the 1/2 meter intervals as you would the secchi depth. Note: Your rope is measured to 10m. Not suitable for deep spots. Don’t wear sunglasses while conducting this test as polarized lenses affect your vision. Position your boat to block waves and lower the disk into the shade created by the boat. This will give you the most accurate reading. Try and get the secchi disk to drop straight down as much as possible.